Early Morning (at 04:00 am) drive to Tiger hill (8,400 ft.) to watch the spectacular sunrise over Mt. Khangchendzongha (28,208 ft. Worlds 3rd highest peak), on your way back visit Ghoom Monastery and Bat asia Loop. After breakfast visit Himalayan Mountaineering Institute, P.N. Zoological Park (Thursday closed), Tenzing Rock, Tibetan Refugee self-help Centre (Sunday closed), Tea Ga rden (outer view), Ropeway and Japanese Temple. Evening free for shopping or leisure. Overnight stay at Darjeeling. This morning after breakfast transfer to Pelling (6,300 ft.). Enroute visit Temi Tea Ga rden, Samdruptse & Siddheshwar Dham (Chardham) in Namchi. On arrival check-in to your hotel. Overnight stay at Pelling. 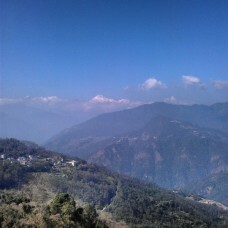 After breakfast transfer to Gangtok (5,500 ft.).On arrival Check-in to hotel & rest of the day at leisure. Overnight stay at Gangtok. After breakfast start for an e xcursion to Tsomgo Lake (12,400 ft.) & Baba Mandir (13,200 ft.) which is 55 kms one way from Gangtok city. Overnight stay at Gangtok. Meals : Day 1 – lunch, evening tea, dinner. DAY 2 to Day 6 – Breakfast, lunch, evening tea/coffee, dinner. DAY 7 – Breakfast & lunch. Rafting or any other recreation charges. Please carry 2 Passport size photographs along with 2 photocopies of Adhaar Card/Voter ID/Passport.Originals need to be carry along.